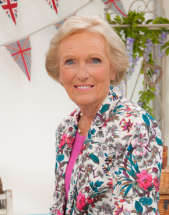 With sixty years cooking experience, Mary Berry is considered to be the doyenne of baking. Mary learned the art of baking from her mother before training at the prestigious Le Cordon Bleu in Paris at the age of just 17. After her training she quickly established herself as a leading cookery writer and broadcaster and throughout her career, has published over 70 cookery books which have been enjoyed by millions of people around the world. In 2012 her contribution to the culinary arts was recognized by the Queen, being appointed Commander of the Order of the British Empire (CBE) in the 2012 Birthday Honours. Mary's personal favorite cake to make is a ginger treacle tray bake, however most people tell her that they enjoy baking her lemon drizzle cake and her tarte au citron. In addition to her baking expertise, Mary has also garnered a reputation for providing practical recipes containing lots of fresh ingredients for the family. In addition to the main series, Mary and Paul present Masterclasses on BBC2, in which the pair of them take over the tent to re-create the challenges that they set the bakers in the series, taking the viewer through each of the bakes every step of the way to get the perfect results every time. In 2013 Mary shared personal milestones, revisited some favourite recipes and talked candidly about the highs and lows of a life at the forefront of British home cooking in ‘The Mary Berry Story’ on BBC2 as well as in her first autobiography. In 2014 also on BBC2 Mary showed us what to cook for variety of different occasions, from scrumptious cakes at a traditional tea party to a slow-roast shoulder of lamb for Sunday lunch in her own series "Mary Berry Cooks." Mary has also judged two series of the ‘Junior Bake Off’ on Children's BBC.